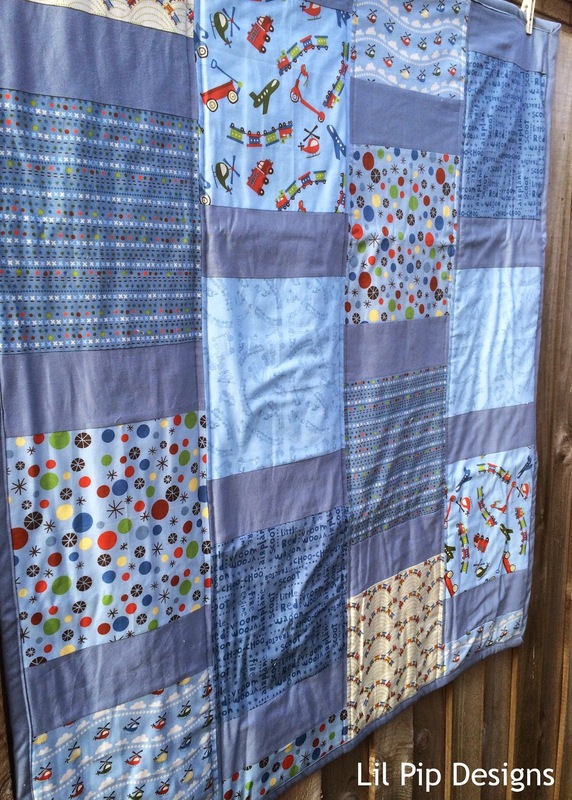 This is what happens when you start out with a plan to make the Cluck Cluck Sew Road Trip Quilt and end up making something completely different! Let's say it is inspired by it! A work colleague knew she was having a baby boy and I wanted to make something special for her. She actually was my maternity leave replacement when I had baby number two (now 6) and now it is her turn to be a mumma. 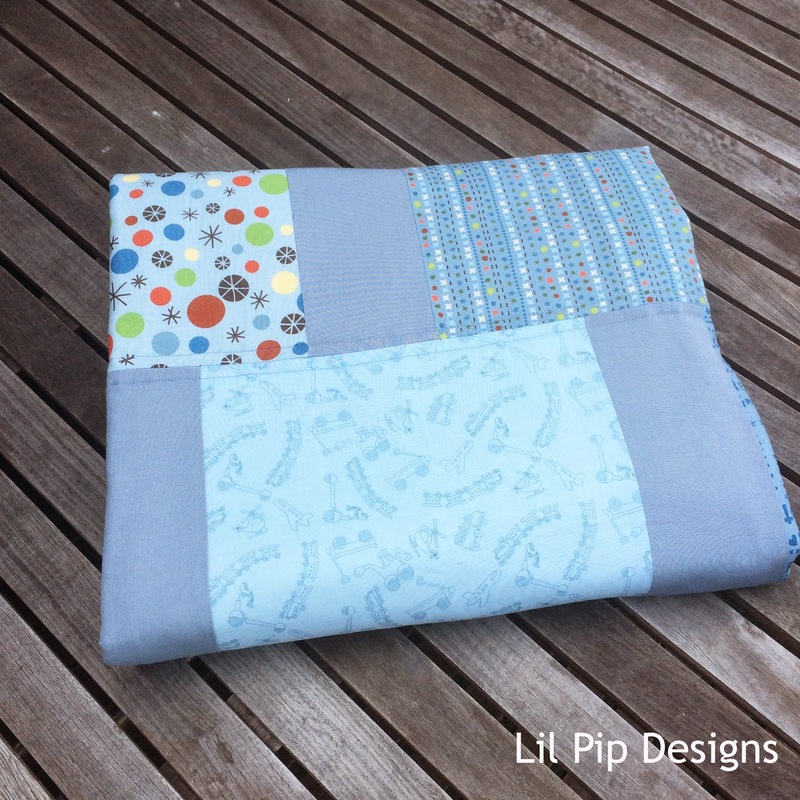 I've had this Fat Quarter bundle of Riley Blake's Scoot for ages and was waiting to find a special purpose for it. The solid grey/blue colour is actually a Tilda fabric that I bought with the intention of making dresses from but it wasn't quite what I expected. Thankfully it was absolutely perfect for this quilt. I used a method of binding the quilt using the quilt back (see tutorial here). I should have read the tutorial more carefully as it recommends using this method for small things like hotpads, table runners or mini quilts. This is a regular cot size quilt so big! 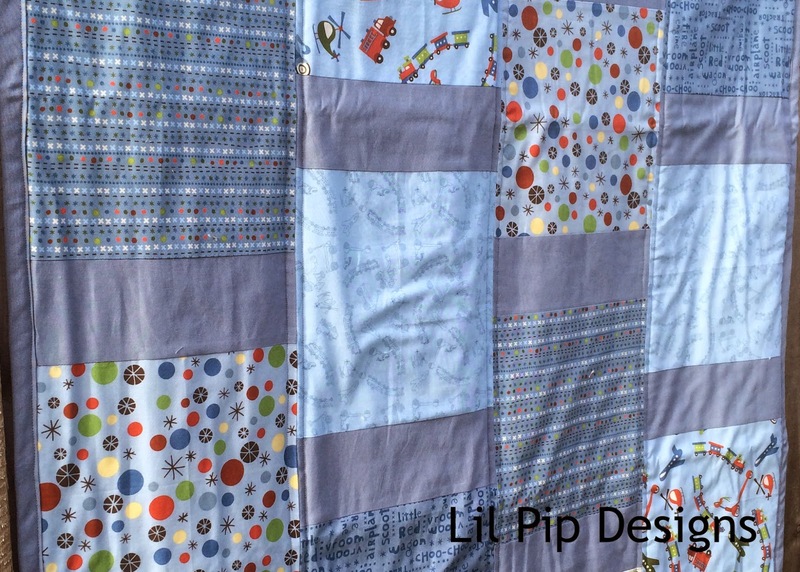 I'm happy with the end result but I wouldn't use this method for a cot quilt again. I just did single line quilting along the length. I'm currently watching a Craftsy class on Free Motion Quilting as that is the next skill I would love to master. I think the best moment (and one that justified the hours of work that went into it) was getting a message the night after gifting it saying her husband "LOVES your quilt. He said ... can't believe Jane made that, it's beautiful and so 'us'. Thank you again". Made my heart sing! !